My 49-year-old daughter has limited abilities, but has worked since finishing high school and has lived independently all these years. In fact, she just paid off the mortgage on her house in Springfield. After 23 years in the catering department at Mercy Hospital in Springfield, Missouri, she was fired for supposedly mixing broken mayonnaise packets in with good ones. No, I’m not kidding. She was “written up” twice before that, once for not preparing the supplies for a co-worker’s event, even though she wasn’t told to do that. My daughter doesn’t handle change well. She doesn’t even like things in her kitchen to be rearranged. So you can imagine how stressful this life changing event has been for her. The HR guy printed out what is in the hospital employee record system about Cathy’s “failure to…..” and the dates of the three warnings. Curiously, they were all during the 3rd week of the month, almost as if the supervisor was expected to find something to criticize at a certain point each month. The “precipitating event” which led to her being fired is, no kidding, the accusation that she mixed leaking mayonnaise packets with good ones thereby ruining them. I told the HR guy this is so bizarre that it reminds me of the Caine Mutiny. He didn’t know what that was. I also told him my theory that the hospital is cutting expenses by getting rid of employees at the top of their pay scale (for Cathy’s job it was $13.78/hr.) and replacing them with folks who will work for half that. He said he’d be shocked and saddened to learn that was true. At the time, my daughter and I believed him to be telling the truth. We left with assurances he would not challenge her right to collect unemployment compensation. He also said HR won’t give a prospective employer negative information about Cathy’s reason for leaving. They supposedly only give out the dates of employment. I say “supposedly” because I know someone who called pretending to be a prospective employer and asked about her son’s firing. She was given quite an earful about him. So “policy” is one thing but actuality may be another. My daughter and I next visited the Career Center which is the arm of the state employment agency that helps people find jobs. We were very impressed with the layout of the offices (in an open circular pattern making it very inviting) and the staff who were extremely helpful. They have lots of resources and seem honestly concerned about the clients they help. The last stop in the process was with a career counselor. She told us there have been many, many former employees of Mercy Hospital coming in for help. In fact, there were 30 from one department all fired at the same time. The work was contracted out. I assume she means to a private contractor, but I don’t know for sure. She said she knew highly skilled IT workers who left because of the pressure and the depressing work environment. I know for a fact that doctors are leaving the Mercy system too. Both of my husband’s heart doctors left and went with other hospitals in the St. Louis area. 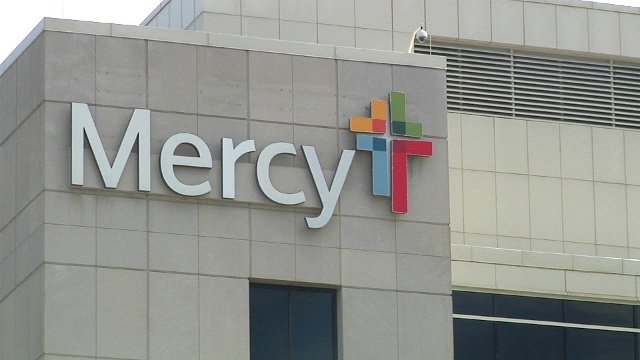 The plastic surgeon who removed a skin cancer from my husband’s ear described Mercy as a company that was “metastasizing” in its zeal to expand. Kind of an ironic comparison from someone who removes cancerous tissue. But it’s not just the Mercy system. My daughter’s husband works in food service at a nursing home that is part of a chain of facilities owned by a large corporation. He makes $8.50 an hour and is expected to finish the work assigned to him in a certain amount of time despite the fact that no one could possibly do that. He is written up if he doesn’t take his breaks and written up if the work isn’t done. Needless to say, there is a big turnover in that place which can’t be good for the residents. Bernie Sanders is right that corporate greed is destroying America. He is trying to start a revolution in the sense that people need to wake up and see what’s being done to them. I’m too old and cynical to think we can escape the clutches of the powerful moneyed interests. My daughter is just one of the millions of Americans being hurt by insatiable greed. We watch the stock market for encouraging news, but who is watching out for the people with no voice? Thank goodness there are non-profit organizations trying to make life better for the people at the bottom of the income scale. They may be our only hope. Previous Post:Voting rights watch: Is the pendulum swinging back toward democracy?